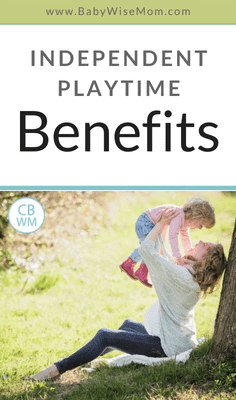 Independent Playtime Benefits. Do not get discouraged when trying to get your child to play alone. It is well worth your efforts! Here are some benefits. Many moms have difficulty with getting independent play going for their children at some point, especially those oldest children. As an oldest child myself, I can assure you all that we love the attention of those around us and it absolutely drives us crazy to miss a minute of the action. So it is understandable that the oldest is a little reluctant to embrace independent play. But it is worth your efforts! I have written posts about independent play in the past, I will link them below. 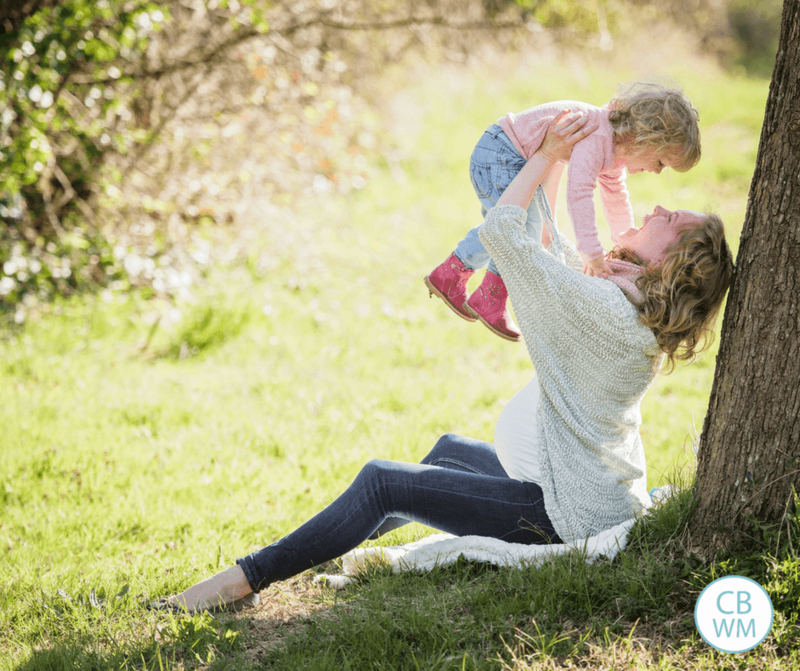 In this post, I want to share a story from my life to illustrate the benefits of independent play. Back in January, we tried potty training. It turned out Brayden (2.5) wasn’t ready. For more on that, read the posts about it. During that time, we didn’t do independent play so that I could watch him and help him go on the potty. What a change that overtook him! I have always known it was good for him. When he doesn’t have independent play every once in a while, he will get a little ornery. For over a year and a half, we haven’t missed independent play for more than a couple of days in a row (while on vacation), and he often tried to give it to himself by going off on his own to play somewhere. During this time off of solo playtime, his behavior morphed. He has always been confident and independent. He never minds being left with a babysitter. He is happy and generally obedient. My little boy changed before me. We went to the library and he about lost it if he couldn’t see me. He would cling to my legs and cry for me. He was very unhappy. It seemed he was experiencing separation anxiety for the first time in his life! He also was not as obedient and seemed to be able to focus less. It is important to note that some of this behavior could be explained by the fact that he wasn’t confident in using the potty. But as soon as we reinstituted solo playtime, he was back to his old self. So if you are having difficulty getting independent playtime instituted at your house, stick with it. The benefits are well-worth your effort! I’m glad to see my little boy isn’t the only one who loses it when he misses roomtime. On the days he doesn’t get it, I feel like I’m am pulled in 20 directions, b/c he won’t leave me alone! When I first started playpen time I thought it would never work. I stuck with it, though and am grateful for it! I’m now teaching my daughter the value of playing on her. She is a momma’s girl and I need the time as much as she does. My friend’s little boy is the same way. We will get together for “play dates”–we both say we need solo playtime first so our boys will be happy :). I started pack n’ play time when my son was very small and for various reasons did not keep up with it. When my son was 2 1/2 I decided I needed to try independent playtime. My only child wanted me to do everything with him. I didn’t know how it would go because he is so active, but I started by playing with him in his room. After about 2 weeks I left him by himself for 10 min, then 15 and it only took about a month and he was at 1 hour easy. Now age 3 he is well adjusted and needs that independent time. Thanks for sharing that Marci! Hi, we just started playpen time two days ago and my son (9 months) HATES it! He screamed for 10 minutes the first day and today as soon as I set him down he realized what was happening and started screaming again. Any suggestions? Is this just something I have to deal with? I don't want him to have a negative association with the playpen (especially since he sleeps in one with my inlaws while I'm at work), but I really think he needs solo time (as evidenced by his response!) Thanks! When my son was 8 months old we tried independent play time but he was very resistent and we didn't have a consistent time everyday. Now he is thirteen months old and wants someone to hold him or sit on the floor and play with him all of the time. I really want to commit to establishing independent playtime every day but i don't know if i should start with a playpen or should i start with room time. I know he will really fight it if I try the playpen on the main floor of our house. My three options would be to set up a playpen in our guest room, allow him room time in the guest room with a few toys and books, or room time in his room. What i am concerned about in his room is all of his clothes are in baskets on open shelves under the changing table. I have seen him try to remove the baskets and dump the clothes. We don't have space right now for a dresser in there. I think the guest room current set up would work better. Since I am starting so late what would be the benefit to using a playpen first and then room time rather than just starting at room time. PwigglesMommy,Your son is about the age of my son when we started late, and I did roomtime, but took it very slowly. There is a post that outlines that. The benefit to the playpen would be 1-some kids feel more secure in the playpen or 2-you know he is safe and not getting into anything. When they are older, they are better able to listen. Thank you for your amazing blog! It has been quite helpful! We are currently transitioning from play pen to roomtime with our daughter's (19 months old) independent playtime. She has done independent playtime since she was a baby, and has been fine in the play pen (30 min – 45 min, consistently). Now that we try to leave her in her room, she completely resists, usually crying at the door the whole time. Do you have any suggestions on how to make this transition? We have our second daughter coming in 3 months (whose crib will be the before-mentioned play pen), so would love to have this set before her arrival. :)Thank you! Hi there, my daughter is currently 14 months. She is my first.We have been following babywise since birth. Because of it we were able to enjoy the many benefits it brings having very little problems. The last 2 months have been very hard. She was having IP consistently since 6 months in our play yard. Only about 30 mins a day but I was content with that. As soon as my d turned 1 everything changed.. She REFUSES to do IP. Screams the whole time. She also is very clingy. She is happy to play by herself as long as I'm watching her but the second I start to do housework or anything for that matter she freaks out and just cries. I try to icnore her because some chorse just have to get done. And she will cry the whole time. She is definitely showing signs of separation anxiety. But loves people and is fine leaving me and playing with others. We have set plenty of boundaries and are strict I believe. So I just don't know what we're doing wrong! Any thoughts or suggestions? Try having her do IPT in her room where she can't see you at all. Thanks for responding! I love this blog and am grateful for the help! While she has IPT I do stay in another room and try to not make a sound.The clingyness and me trying to do things around the house is just or normal our normal everyday struggle. She wants all of my attention. Back to IPT, I've been using the timer, but that doesn't seem to be helping. Should I just stick it out and restart the process by trying for a small amount of time? Thanks Valerie! Try engaging her in what you are doing at home. SoIf you are trying to cook and she is clingy, see of there is something she can help with or have her sit in her high chair and do something. Getting her used to IPT will help with that, also. I would stick it out and use a timer. A short time is good, but not so short that she won't give playing a go. Some people say they had no progress with 5 minutes, but when they moved to 10 minutes, the child would start to play and enjoy it.